SHC (SOK) “Kamchia” is a Bulgarian legal entity, whose shares are 100 % property of the Government of Moscow city. Sanatorium and Health Complex “Kamchia” is a unique institution of modern type, integrating functions of a Recovery Center, Children's Camp, School, a Palace for Children's Creative work, Sports and Rehabilitation Center. In the same time SOK “Kamchia” is strengthening position and recognition as an institution without any analogue, not only establishing standards at the area of the social recovery, recreation and rehabilitation, but alone is initiating and materializing innovative projects, ensures services in the area of education, culture, sports, etc. The activity of SOK “Kamchia” creates for the guests of the Complex an environment that inspires and educates understanding of organic link "Man-Earth-to-space" contributes to the development of children's abilities, talent and promotion of genuine human virtues. The Complex is constructed among a preserved nature – clean sea beach, river, forest, neighbouring on a Reserve protected by UNESCO. All buildings are situated in an oak forest, a handsome park with botanical zones, eco-paths, summerhouses, places for campfires, zones for relax, sports and entertainment are carefully maintained. The guest's accommodations are offered in Hotel complex “Longoz”, Children's Health Camp “Raduga”, Children's Health Camp “Chernomorskii” as well in Cottage Village “Pirin”. The nourishment is organized in Restaurant complex “Crystal”, the restaurants “Longoz”, “Panorama”, “Raduga” and “Flagman”. Menu is offered in coordination with dietary experts, as well specialized menu can be ordered. There are several shops, hairdressing salon, bowling, mini golf, internet clubs, libraries, medians, rent a bicycle and more. The beach is equipped with sunshades, wooden paths, easy chairs, locker rooms, medical center with ambulance, a rescue office and team are working. SOK “Kamchia” has constructed and a contemporary Educational and Teaching Center (School) “Yourii Gagarin” operates. With the commissioning SOK "Kamchia" acquired contemporary and modern basis for its further development and approval as an international center for innovative technologies in the field of pedagogy, education and teach, science, culture, healthcare and social life. Educational and Teaching center (School) integrates the leading global experience working in schools, homes for children's art and children's camps. The Center is including a school with 18 cabinets, teaching and acts hall, pedagogical rooms, sports hall, music hall, dancing hall, exhibition hall, children's media center, press center, Aerospace center with Planetarium, Observatory, Inter-active model of the lander “SOJUZ-TMA” and many others. All class rooms have interactive boards, multi-media units, as well – tablets for the pupils. The Educational and Teaching Center (School) “Yourii Gagarin” has a License obtained by the Bulgarian Ministry of Education, Science and Technologies and is registered as an Advanced School including intensive study of Russian language. SOK “Kamchia” is offering a wide range of cultural and entertainment Programs. The Complex has two Concert Halls for 600 seats each, Atrium with 400seats, Amphitheatre with 2000 stools, two community centers (“Raduga” and “Chernomorskii”), Exhibition Halls, Slavonic Center, libraries, many halls for circle and group activities, clubs and master-classes. 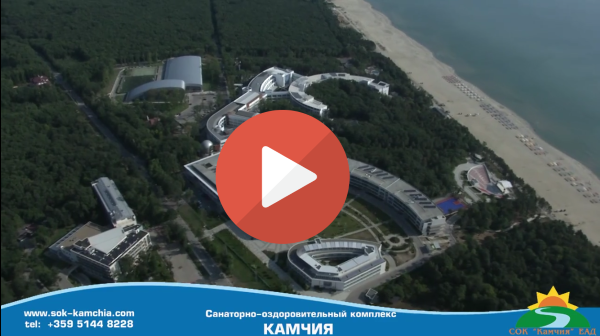 Sports Complex “Kamchia” is constructed and operates on the territory of the Complex – a contemporary multi-functional complex, built and equipped by Olympic standards, meeting all the requirements of the International Federations of different types of sports. It includes covered pool Olympic standards, athletic track, multipurpose field can be transformed into an ice rink, fitness halls, table tennis hall, medical center/s, coffee bar, outdoor soccer field and two universal playgrounds for basketball and volleyball. The multi-functionality of the Sports Complex allows to simultaneously use both daily sessions with the sport and for international duty training and competitions. A team of professional instructors offer their services for the proper conduct of training and sports activities. The Medical, Diagnostic and Balneological Center “Zdravetz” has 14 specialized cabinets, clinic laboratory, X-ray cabinet, cabinets for physiotherapy and rehabilitation. It is covering Consultative89 and Diagnostic Cabinets incl. functional diagnostic of the dental medicine, ophthalmology and otorhinolaryngology. Regarding the rehabilitation activities the Center encompasses the basic sectors of the recovery procedures: physiotherapy, phototherapy, physical therapy, inhalations, water-therapy and solarium. A very high level of furnishing the premises and the medical equipment, facilities and technology are available at MDBC “Zdravetz”. The center is using the latest and new methods of treatments and rehabilitation by high level qualified doctors and medical experts. The Medical Diagnostic and Balneologic Center offers medical diagnosis and treatment for primary and outpatient care, a wide range of clinical, biochemical and physical examinations as well almost all methods of physical medicine for rehabilitation and recovery. The sole Amphitheathe with 2000 stools in the new history of Bulgaria is constructed at the Sanatorium Recovery Complex “Kamchia”. It is equipped with contemporary technical facilities for carrying out of international festivals, cultural and educational programs. It is situated immediately at the sea coast and behind its stage an unbelievable sea panorama is discovered. The SOK “Kamchia” activities have been appraised with a number of prizes, certificates and other forms of confession. Only in Year 2012 SOK “Kamchia” is prized for third consecutive time Certificate “Investor Class A” from the Ministry of Economy, Energy and Tourism of Republic of Bulgaria, National prize “Investor” and the great award of the National Contest “Building of the Year 2012” – “Most Significant Investment Project with Unique Conception at the Area of Culture, Education, Healthcare and Sport”, and Sports Complex “Kamchia” is appraised with “Building of the Year 2012” in Bulgaria in category “Building for Sports”. Besides conditions for recreation, sport, therapy, rehabilitation, the Complex is offering opportunities for business meetings, seminars, symposiums, presentations, exhibitions, conferences, congresses, sports training camps and competitions, pastime on interests and carrying out of a full value educational process for pupils as from I-st to XII-th grade as well for students, concerts, festivals and other events.